This three-day safari is a popular option especially if you're not sure if a liveaboard cruise will be the right thing or you want to combine your stay in Sinai with land-based activities. Fantastic coral gardens, drop offs, endless walls and colorful slopes rich in marine life will be visited on this safari. 1. Day Evening: transfer to New Marina (El Wataneya) Port and embark. Welcome on board, cabin arrangement and boat-briefing. Permission work with port authority, sailing very early next morning. 2. Day Morning: check dive at Temple or Ras Katy. Next dive is Jackfish Alley where you can easily enter the small caves there. The third dive will be at Shark and Yolanda Reef, the southernmost tip of the Sinai Peninsula with an endless wall - unique in the Red Sea. If you like night diving then Temple will be a great location to jump in. 3. Day Morning: boat sails to the Strait of Tiran. Your first dive will take you to Jackson Reef the most northern in the Strait of Tiran. After breakfast get ready to visit Woodhouse Reef, which is perfect for a drift dive along the sheltered eastern side. Your third dive of the day will depend on sea conditions either at North or South Lagoon and an optional night dive at the South Lagoon. 4. Day Morning: first dive of the day is usually Thomas Reef, the smallest of the four Tiran reefs but probably the most interesting and richest in marine life. Next dive is Gordon Reef, which gently slopes to the south and forms a large plateau. After lunch you will leave the reefs of Tiran heading towards Sharm for your third dive at Ras Nasrani, Ras Ghamila or may be Ras Um Sid - your choice. Return to New Marina (El Wataneya) Port and disembark. You need to be a PADI Open Water certified diver or equivalent with at least 15 logged dives. PADI OWD´s are able to join in night dives onboard if they have previous night dives logged. PADI Advanced Open Water diver or equivalent is recommended for some of the more demanding dive sites visited on this safari. 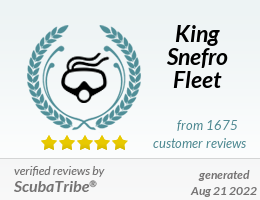 You must have dived in the last year and recorded this in your log book to join this safari. Scuba Tune Up is available on request. This trip is suitable for snorkelers to join.